Directed by Vadim Perelman. Written by Vadim Perelman and Shawn Lawrence Otto. Based on the novel. 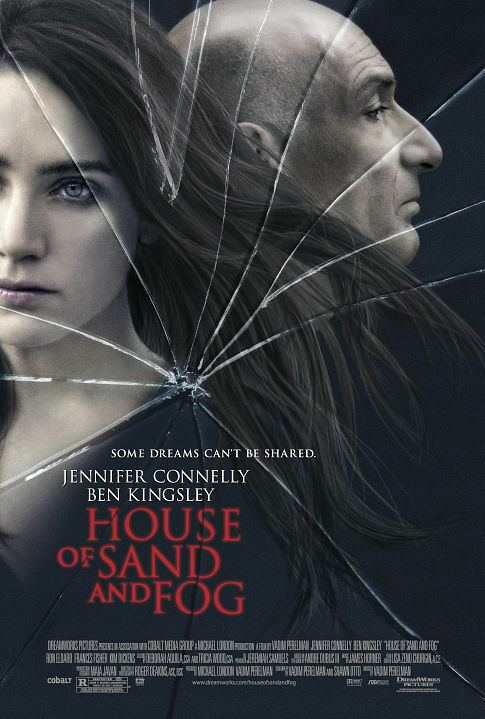 House of Sand and Fog would have been an interesting tragedy of failed potential and the struggle between two parties to be the tallest in a snake pit. But the film is riddled with at-best saccharine dramatic movements and unintelligent plot mechanics which renders the work abjectly atrocious despite the laudable acting performances. In the film, we have a series of misfortune, with the timeliness of them making an egregiously obvious predestination of fate, obviating the suspension of disbelief that every dramatic work must necessarily fulfill in order that a subject can widen his soul as gapingly as possible. “Losing one’s self” in an artwork is a feat of dissolution of one’s being into a completeness with the art during the interactivity. Only with this requisition, where the subject elevates his soul beyond the profanity of his ego’s primal instincts, can an artwork be allowed to dance. Instead here, we have stuttering steps and stumbles which are painful to witness, and yet are another emblem of the decay of the Academy of Motion Picture Arts and Sciences to honor such poorly produced cinema. The emphasis here is on the speculation that the uneven character developments and their unrealism is a cause of poor cinematic manufacturing rather than poor raw materials, i.e. the actors and original screenplay. This is a film that seems clearly molested to fabricate drama for indulgence rather than for revelation. How convenient, for instance, that the only possible romance happens to be accompanied with infidelity yet can be excused because the marriage is loveless. Quite simply, it is distracting from what glimmer of truth we can peak at. And what would that truth be? That acting in one’s self-interest is a bad thing? The Bharani clan is a proud one, and has a reputation to uphold to its society. If it did not strive to maintain its social standing, if it was apathetic like a former alcoholic who does not open her mail for months, it would not allow its children to marry comfortably. Perhaps at the heart of the film is this cynicism toward propriety. After all, the lack of it is the prime movement in the tragedy. It ought not be wrong that the world favors those who respect and tend to what they own. From this perspective, we can see that the favoritism towards meekness, in not demonizing the woman and her reckless abandonment, and not seeing her as a havoc on two family lives, is a Christian virtuous bias. As I’ve written elsewhere, poverty and virtue can be mutually exclusive. So, this moral fabrication, which disorients the audience from a grander truth inaccessible to what is acculturated normally in a modern Western society, that ownership is responsibility, is in addition to the terrible film production. If we did not have a thrilling example of Nietzsche’s critique of pity on full demonstration in the film by the lead woman of her failures, of her utility of weakness as a means of her own self-interested pursuits, this would have been a total disaster. Instead, it can be held as emblematic of a sick contemporary culture in need of an antiseptic.